Duratrack provides custom metal fabrication services to a wide range of customers. 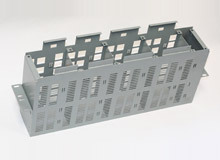 This enclosure was produced for a customer in the telecommunication industry. It is constructed of 0.050″ cold rolled steel and measures 13.179″ x 6.973″ x 3.737″. 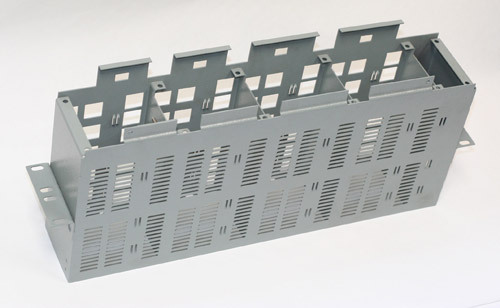 Components were laser cut, punched, stamped, spot welded and riveted prior to powder coating. Tolerances of +0.007″/-0.003″ were maintained for this enclosure and dimensions were verified with calipers throughout the manufacturing process. Fasteners were tested using PEM hardware push out methods, and powder coating thickness gauges were used to ensure that customer specifications were met. We produced 600 of these battery enclosures for our customer in Wisconsin. The typical lead time on a project this size is 2-4 weeks. For more information about this custom metal fabrication project, see the table below, or contact us directly. This enclosure is used as part of a portable cell tower for backup communication systems.